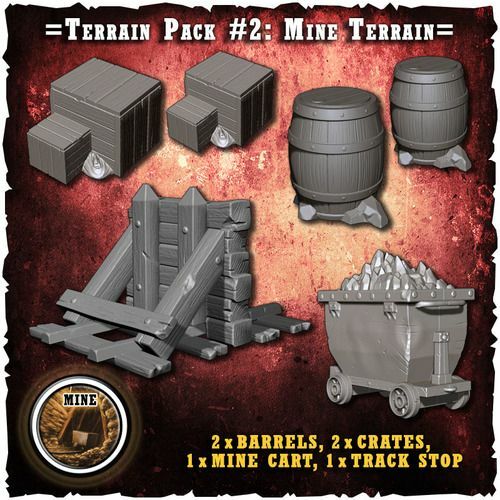 Shadows of Brimstone: Mine Terrain (and some crates from Grendel) | Azazel's Bitz Box. The last of the painted models from April to show off, these were once again some Shadows of Brimstone bits that I found and decided to quickly knock together in order to hit 30 models in the 30-day month of April. The quality in this kit is probably best described as variable. The buffer stop is rather excellent. Nice and chunky. The actual stoppers look a bit oversized, but fine. I painted the reinforcements and such as metal rather than wood mostly as an excuse to get some more colours onto it, and I’ve gone for a pale wood, not quite grey yet – to represent aged wood. I’d have added some grass, etc, but since I figure this is going to spend a lot of time deep in a mine when playing SoB, I’d keep it without any of that sort of thing. This is what was shown in the Kickstarter. 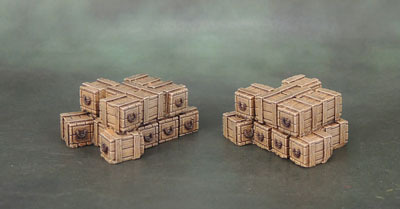 So when the sprue arrived, the photo of painted minis above provides both of the “2x crates” and one of the barrels. (yeah, even though the render shows 2x double-crates). Want to see the other barrel? See that tiny thing that’s the size of the Space Marine’s head? Yeah, that’s the other barrel. So I’ve left it on the sprue so I don’t lose it, since it’s useless as a bit of scatter on it’s own, and will need to be glued to something larger to have any use at all. The other thing is a pickaxe, which wasn’t promised, but I guess takes the place of the other crate. I’m not exactly what you’d call upset – mostly because I have many other barrels and crates, but it’s a bit annoying and silly. 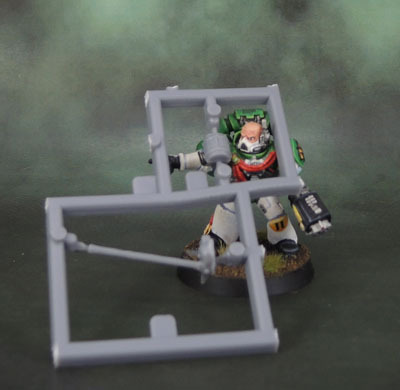 They could surely have fit another of the crate piece or the barrel on the sprue in place of that stuff. Anyway, on Monday night while I was working my way through this stuff, and the Pylons, and the dive-suit Harvesters, and the Auto-turrets, it quickly became apparent that I was not going to get he turrets finished before April ended. So I went searching for some simple resin terrain that I may not have painted. I found this pair of crate stacks, which I picked up in the 90’s from Grendel (now Scotia Grendel), and quickly knocked them up over an hour or so (mostly drying time) while working on the other stuff. In doing that, I hit 31 models for the month of April – which achieves my goal for at least one miniature for each day, every month in 2018. 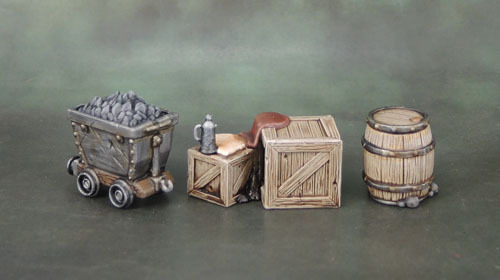 Here’s the “Mine Terrain” set, along with the crates, and a Space Marine to provide scale reference. 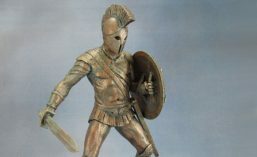 Tomorrow, my Assembly April stuff, then the Community Assembly April, then my rounded-up painted April stuff. Then back to April’s minis. This entry was posted in Board Games, Shadows of Brimstone, Small Scenics and tagged Mine Terrain, Scotia Grendel 1007 Crates, Shadows of Brimstone. Bookmark the permalink. Yep. Keeps the piece much more versatile. It even works for Western-style situations! Oh, good point on the Western-style bit. 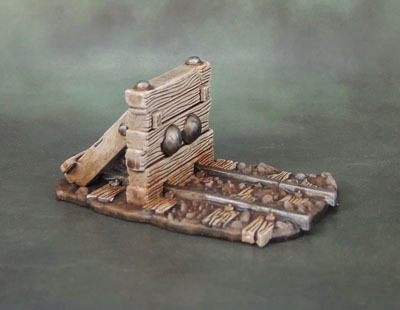 The aged/bleached wood look, seemed weird to me for underground mining bits, but would work really well for a Western theme. I guess with the wood, I would think there would be mold, rot, etc. or be darker because they applied heavy oil to keep it from molding or rotting. I don’t know, I’m over-thinking it. Yeah, SoB is a Weird Wild West-themed campaign Warhammer-Quest style boardgame. Yes, really, despite laser turrets. It has “rifts”, you see! I wanted to straddle the line and go with something feasable for indoors or outdoors. Indoors it’s from a dry and dusty mine (because western! ), and the dry wood has been repurposed from outside something something. Ah, I didn’t realize SoB was Wild-West themed. I had only seen the laser turrets and the big Diving Suit looking guys. Interesting that is it also WHQ style. Yeah. I think the more proper “weird west” stuff is in the core games boxes, while I’ve been scrounging through random sprues in the big box of loose kickstarter product looking for things that will assemble and paint up quickly. Supposed to be quite a good game, too! Agree with IRO. Good round up. Thanks Mark. My painted round-up tomorrow! I really like the shade of brown you’ve used for the wood on these. Thanks Curis. It’s 50-50 Vallejo MC US Field Drab and Army Painter Ash Grey, highlighted with VMC Iraqi Sand, washed with AP Dark Tone and then highlighted again with VMC Pale Sand. I wanted a dry looking, greyish wood. The grendel crates were a bit richer. Basically the same deal but with VMC Japanese Uniform instead of VMC Field Drab. Nice work on these. That tiny barrel is really disappointing. Seeing that, I think I would immediately avoid any of their Kickstarters. That seems like a major ripoff. Yea, it’s a minor thing overall, but not cool. Well, it’s a tiny disappointment in a Kickstarter that literally delivered a giant box (of sprues, and a few boxed supplements, to be fair). The “Mine Cart” pledge (as they called it) was an odd one. It steadily increased in price as more stuff got added, so it was a completely amazeballs deal to the people who got on at the start, and still pretty good (assuming you manage to use all that stuff) for those who got on at the end. On the other hand, the Mine Doorways “Doorways into Darkness” set in the KS overdelivered at least as much as the mine scenery underdelivered, so swings and roundabouts. Yea, if it was just one tiny thing in a big box of stuff, I’m sure I might have given them a pass too. Yeah, that’s pretty much where it fits. 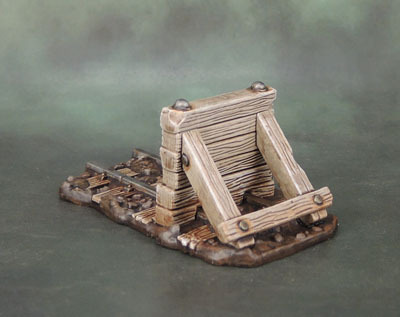 A minor annoyance, but in the end it’s only a couple of bits of scatter terrain – one barrel and one crate. Not like I don’t have those from elsewhere. 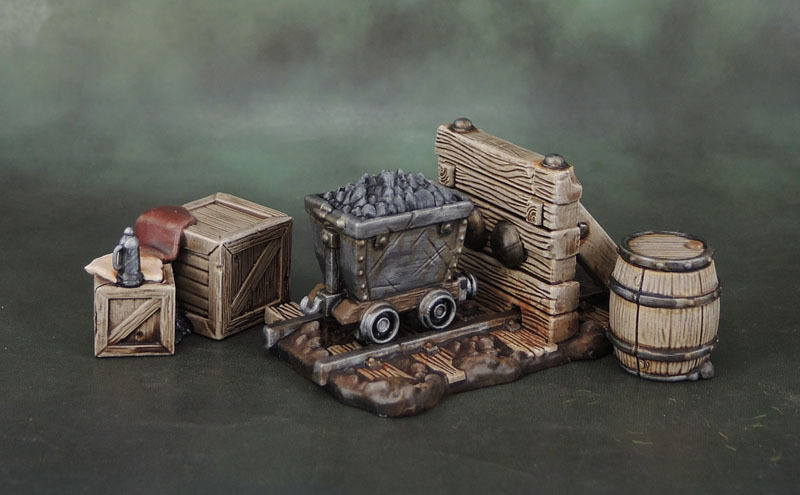 Pingback: Shadows of Brimstone: Doorways Into Darkness (Mine Doorways) | Azazel's Bitz Box.